Liberty services all industries including manufacturing, staffing, technology, oil & gas, construction, healthcare, education, finance and transportation. Our flexible solutions provide the backbone for an excellent workforce and confident businesses. If you are a new organization or just starting an employee screening program, let Liberty guide you. Liberty can provide answers to reduce risk and liability, to screen current employees, and develop packages that meet internal and external customer requirements. Easy online access compatible with any device – all you need is the internet. Easy to understand reports and user-friendly interface gives you only the information you need. With growth comes challenge: Compliance issues, competitive markets, and of course, a growing employee pool. Liberty’s solutions put the power in your hands. 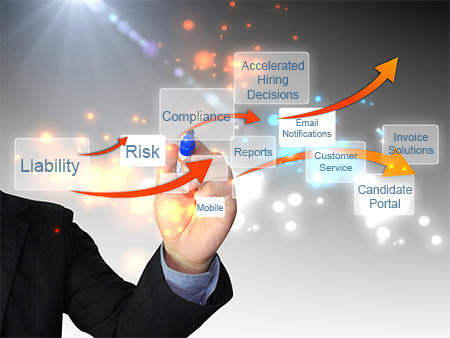 Accelerate your hiring decisions with reduced administration. Real-time email notifications on your mobile device keeps your hiring process streamlined. On-demand customer service means you’ll never wait for answers. Large businesses have big needs and Liberty’s online enterprise solutions is built with those needs in mind. Consolidated, division-based, billing solutions and candidate portal for easy data capture, easily access management reports to audit divisions and locations instantly and world-class data security. Our packaging solutions ensure your hiring agents stay consistent with company goals, increasing consistency and mitigating risk.